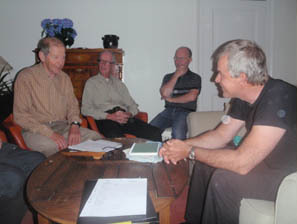 At the 100th jury meeting and the first this year should Peter’s paddling be scrutinised. Peter has grown custom as he has passed this needle eye trice before. 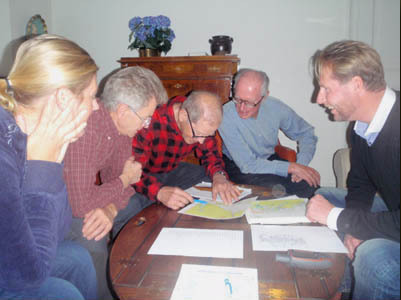 In the jury this time were Jim Danielsson, Sven Berggren, Mats Grindvik, Thorvald Nielsen, Bengt Larsson, Magnus Fischer and Curt Ostwald (honorary member of the jury). These full forced members of the jury were all pleased to meet Peter again. According to received information Peter had very nice order in his logs. Tremendous I will remember was mentioned and surely not without that earlier tours had given experience. 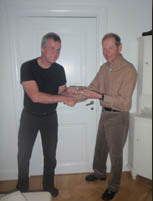 The meeting proceeded therefore soon with handing over the Miniature kayak handmade by Mats Grindvik and peter isn�t hiding his proud and joy. 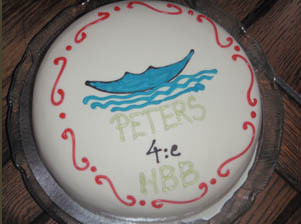 Later Jim came with a delicious cake to celebrate Peter's fourth time approved HBB-paddling. To the caller has also Gun joined in and the atmosphere was very nice. That's how the 100:th jury meeting in HBB was ended and we all that have or shall paddle HBB say thank you to Jim even if also the troy members of the jury should get their share. 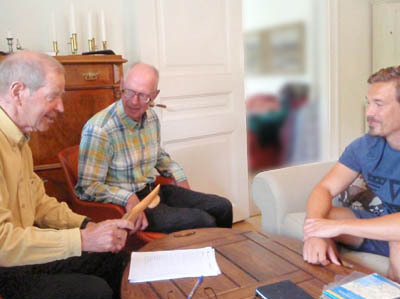 After having ended his paddling along the Finnish coast Erik stopped at Stockholm on his way back home in Denmark to go through the meeting with the jury. 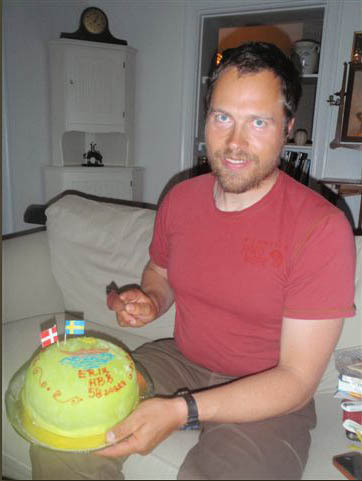 He had now paddled the three coasts along Norway, Sweden and Finland. He started April 5 and has since then lived in his tent and kayak. 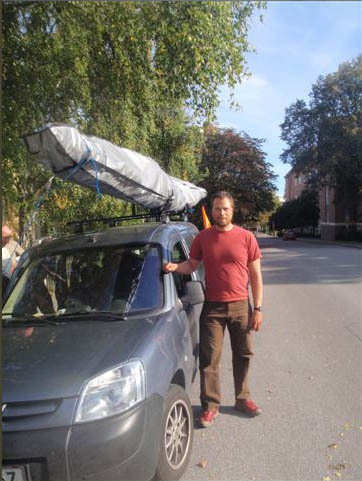 His total distance was 6443 kilometres in 175 days. 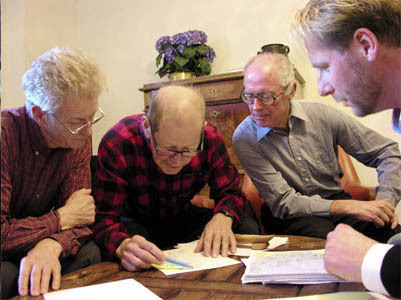 All the time has Erik documented the tour in word and photos at his homepage. Here are photos from his meeting with the jury. 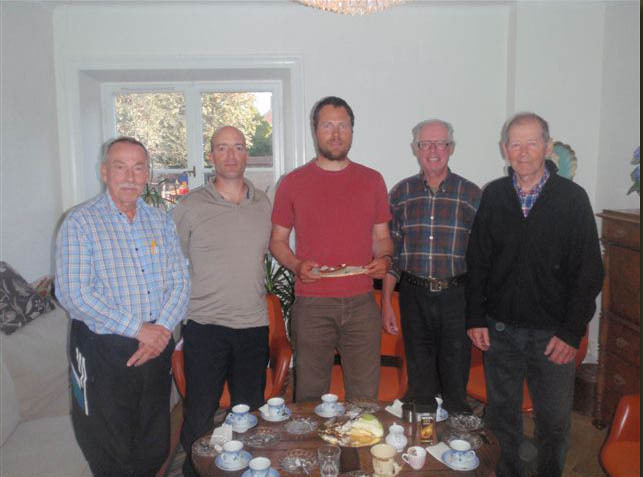 The jury called on duty this morning were Bengt Larsson and Magnus Fischer at the right side of Erik and Sven Berggren and Jim Danielsson at his left side. It became a morning meeting In order to not delay Erik more than necessary on his way back home. 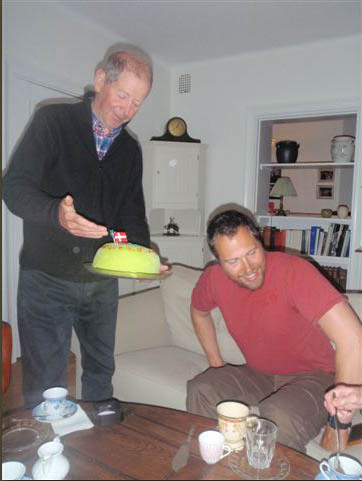 Surely something inside Erik called for “Home, home” after half a year without wife and daughter. 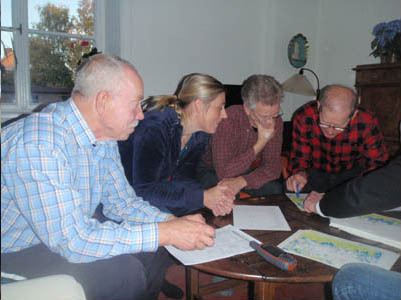 The actual meeting was son started and in due order were the logs scrutinised and place by place could be picked off. ... that Erik received with great satisfaction. Erik had all the time only used a Greenland paddle. Well, only to the shape as his was made of carbon and Jim had the opportunity to inform himself of its abilities. 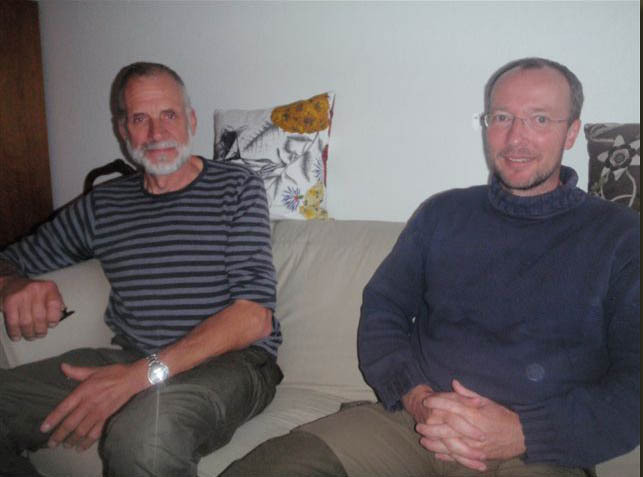 Leif and Niels – two friends met Erik by car at the Finnish goal – Virolahti. 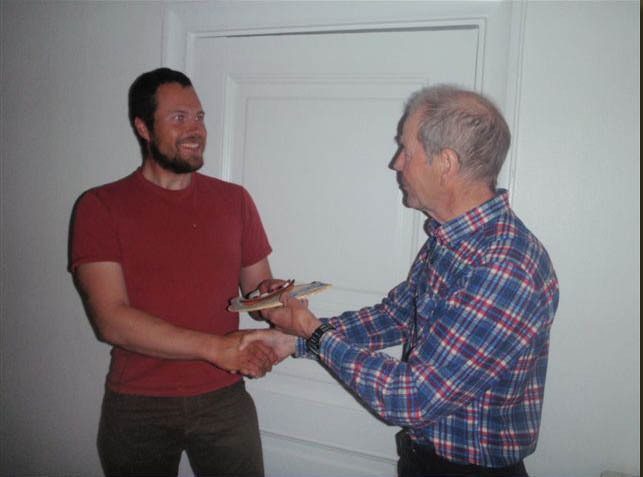 It was also Leif who assisted Erik with the transport to the north of Norway this spring. Here they had the opportunity to follow a part of the tour. 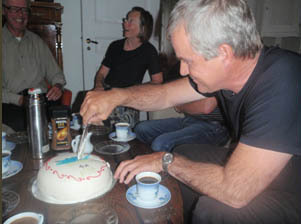 Jim is here entering with a delicious cake and presents it with in words and gests. 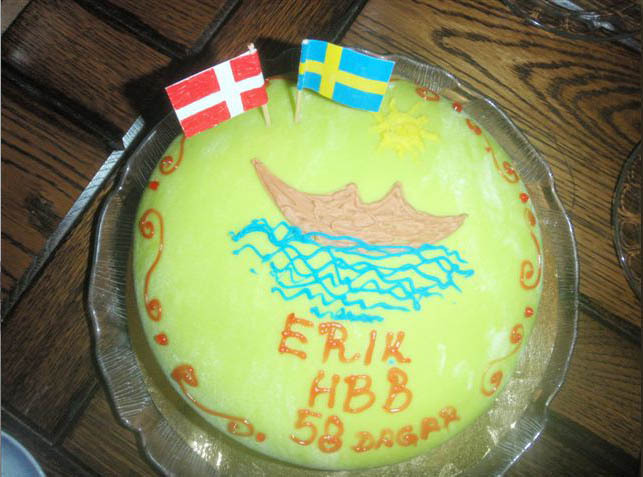 Surely will the decoration celebrating this Danish-Swedish meeting get some remarks and Erik is ready to start. 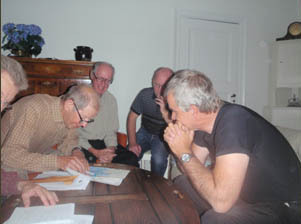 Now Erik and his friends will continue and are still on the go as this page is made readable just a little more than 24 hours after he reached the Finnish goal and only 5 hours since the meeting. 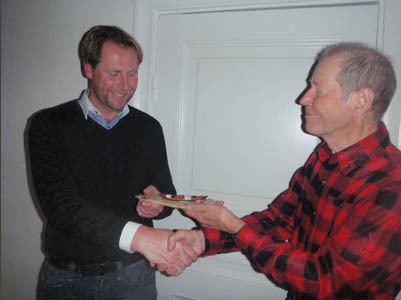 The third meeting this year was held for Patrik. 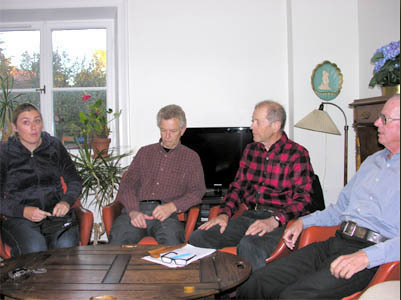 The jury members Louisa Rolandsdotter, Thorvald Nielsen, Sven Berggren and Bengt Larsson met at Jim�s place. 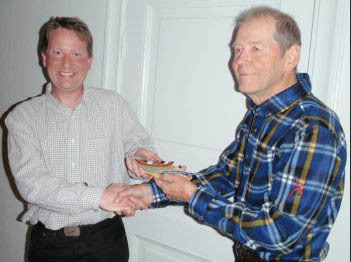 To this meeting had also I (Lennart Bergström) come as I have had several contacts with Patrik before, during and after his tour. A pleasant meeting. 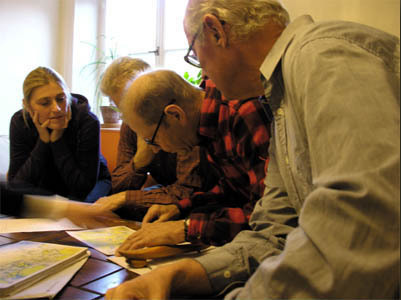 As the meeting should start were all gathered around the table. To the left outside picture sat Bengt with his camera resting at the table in front of him. 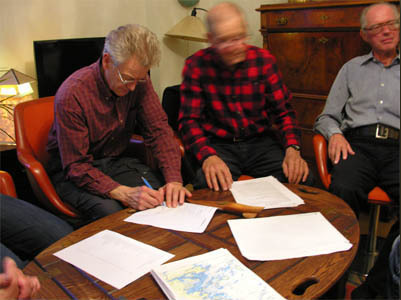 In the meanwhile Patrik brought forth his logbook and sea charts and the scrutinizing started and went on until his pile of charts and log were thoroughly gone thru. After the candid question eye to eye from the chairman Patrik answered upon his kayak-honour at stake had red and followed the rules. No member of the jury had further questions or any objection. As far it concerned his tour that is. 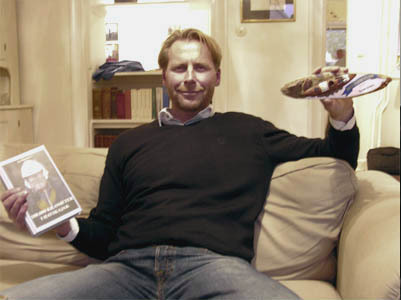 Thereby was Patrik approved as conqueror of HBB. 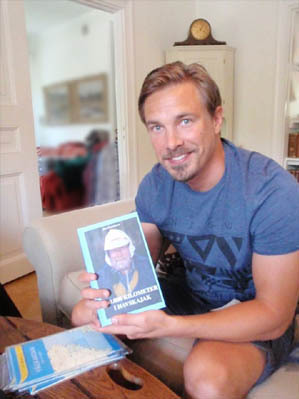 The record of the meeting was signed by present jury and Patrik got Jim’s book “100.000 KILOMETRES I HAVSKAJAK” and this was also signed by the chairman and his jury. 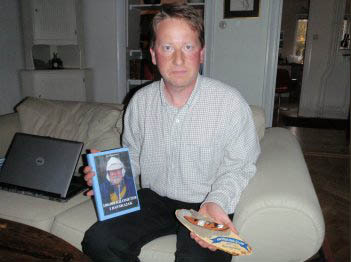 As Patrik had received the miniature kayak he could also proudly this together with the book and #5 of the meeting beer and sandwiches was served. A lot of different experiences were told from paddling. 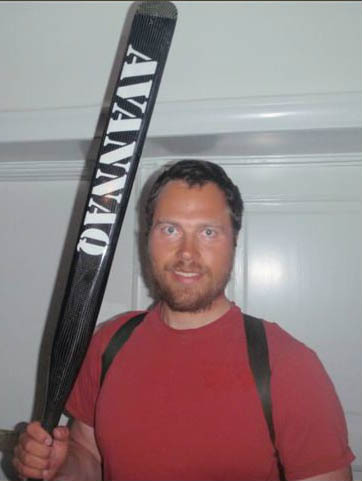 Patrik told about his Eskimo paddle and it came forth that he probably not was the first to have paddled the entire HBB with such a paddle. It had however worked well, but as it had hit some of all the rocks it had started to splinter. Patrik, afraid of puncture his float if needed, had had to tape it thoroughly. A problem one doesn’t have if one is able to roll. 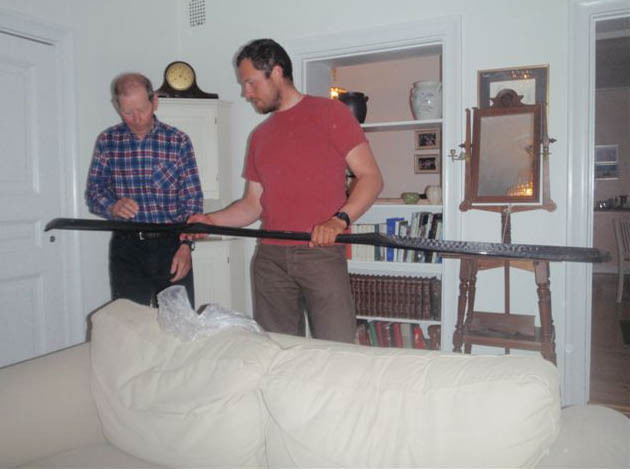 The paddle Erik b. Jørgensen showed to Jim (se above) didn’t have this problem as it was made in kevlar. I also heard this paddle was something in between an Eskimo paddle and a wing paddle. One side was concave. An interesting hybrid. 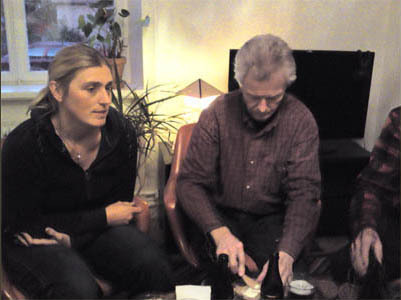 Louisa also asked if Patrik had found some areas more memorably than others. 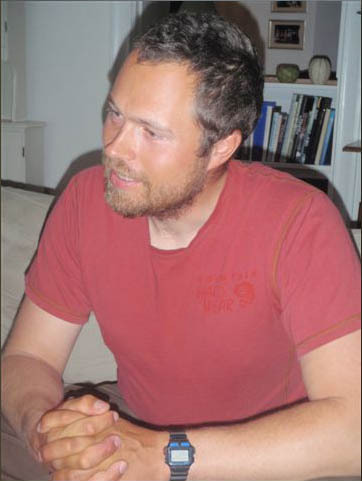 His answer was maybe as expected that the North part of the west coast (Bohuslän) came first in his mind. 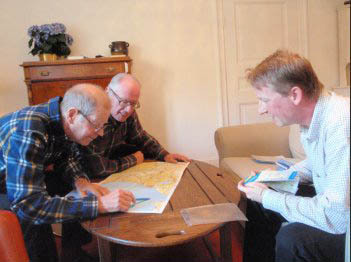 Followed by coasts of Småland and Östergötland, Uppland, Lule and Pite archipelagos. Many places were also mentioned and appeared as pearls among all the stones. The fact is that there are parts that are tiresome and boring, if not arriving from landside as a sunbather, is something that belongs to nature. Steep cliffs or ‘everlasting’ beaches with sudden spots like oasis to us paddlers. 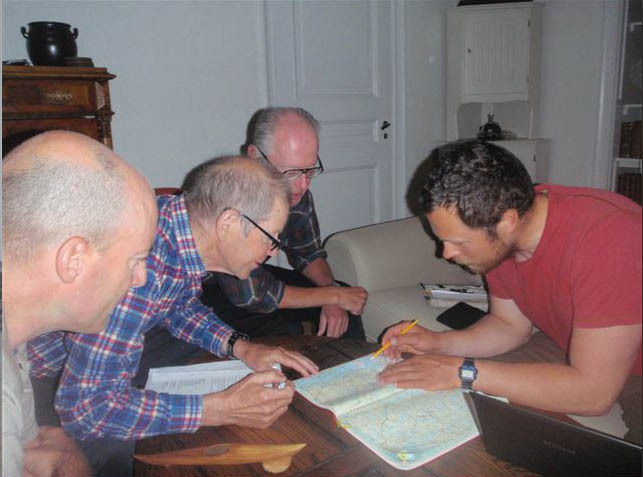 Patrik wasn�t less welcome by this and came well prepared and with in good mode with maps and log in very nice order. 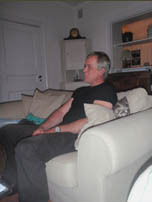 Two sharp heads together scrutinising and a tensed Patrik. Due to the perfect order was the main part of the meeting soon a memory well kept. 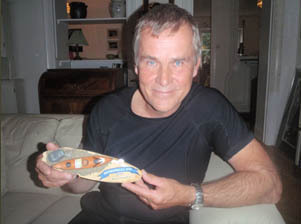 Proud and happy could Patrik soon receive the miniature kayak from Jim and Jim’s signed book as well. 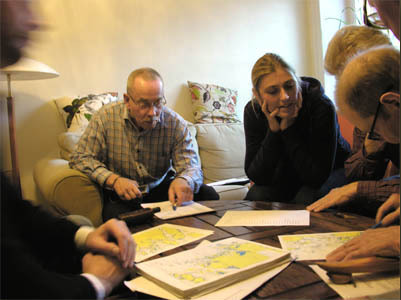 This jury meeting that should have been held 2011 could not be held as Peter had escaped to the States. Maybe from pure fear to stand in front of the jury. Should this be true, he in that case got courage from his visit abroad and accepted gladly to meet the jury this year. 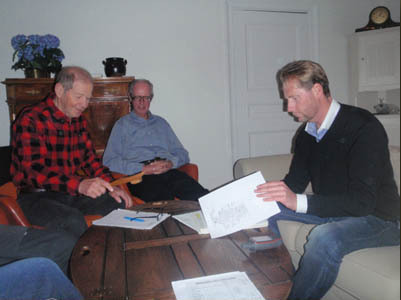 Apart from Peter Svanberg to the right is today’s jury seen and represented by Thorvald Nielsen, Jim Danielsson and Sven Berggren, but also Bengt Larsson not in picture as he holds the camera inaction. 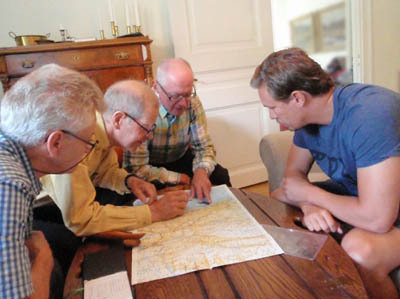 Map by map was unfolded and sharp eyes scrutinised the drawn track. Peter sat calmly and answered the questions put to him. Finally could this summer meeting be fall of the gavel and Jim was the first to congratulate Peter to an approved tour. 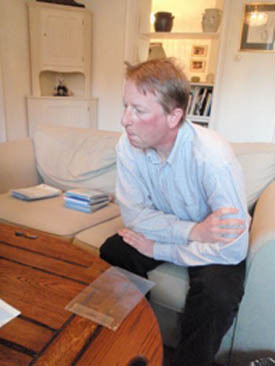 A happy Peter later received the book written by Jim and this jury meeting held at summer time could be concluded. Never was Peter afraid of the jury meeting and an escape was never meant, but only that he left before the meeting could be held.